No matter what type of ankle fracture has occurred, there are some basic treatment principles that can be accomplished with a few simple steps. Your surgeon will help guide you on treatment specifics, such as if surgery is necessary, but here are some of the basics. Swelling is almost universally seen following a broken ankle. An important part of treatment of an ankle fracture is to minimize swelling. Limiting swelling will help control the pain from the ankle fracture and minimize the damage to the surrounding tissues. Immobilization of an ankle fracture is commonly performed in the emergency room. Usually, a splint will be applied to allow the ankle joint to rest and the swelling to subside. If the ankle fracture is not badly displaced, the splint may be put on without moving the broken ankle. If the broken bone is out of position, a procedure called a reduction of the fracture will be performed to reposition the bone. 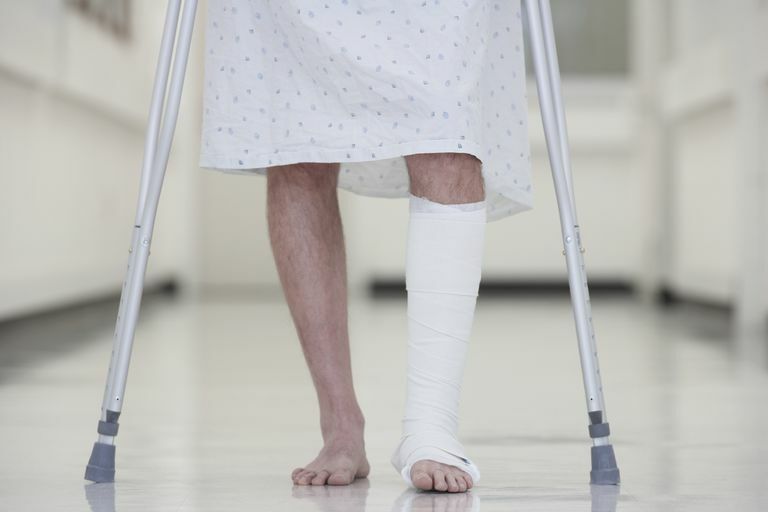 Crutches are important because almost all types of ankle fractures will require some level of rest following the injury. Sometimes, patients will not be able to place any weight on the ankle for several months, other times within days to weeks. Determining when you can place weight on the broken ankle depends on the type of ankle fracture; this will have to be discussed with your doctor. The most important factor to consider in deciding on the treatment of an ankle fracture is the stability of the ankle joint. The ankle joint is where three bones come together, and allows the foot to bend up and down. If unstable, the mobility of the joint may be impaired, and there is a high likelihood of the development of early ankle arthritis. The reason the joint wears out quickly is similar to a car wearing out tires when the wheels are not properly aligned. The most common reason to perform surgery on a broken ankle is because of an unstable joint. Specific issues with a patient's health may influence the decision to proceed with surgery. While the goal is to give everyone a chance at full recovery after an injury, it may not be worth the risk of surgery in some patients. Of particular concern with ankle fractures are people who may be at high risk for infection and healing complications. These include people who smoke, have diabetes, or have peripheral vascular disease (circulation problems). It should be noted, that in most situations, surgery is still recommended even in people with these conditions. However, there may be changes in post-operative management to rehabilitate the patients less aggressively. There are some types of injuries that require surgery, one particular case is an open fracture, also called a compound fracture. These injuries occur when there is a communication between the skin and the fracture. These injuries have a high chance of infection, and therefore immediate surgery is almost always necessary to clean the area of the wound and either temporarily or permanently stabilize the fracture. Michelson JD "Ankle Fractures Resulting From Rotational Injuries" J Am Acad Orthop Surg November/December 2003; 11:403-412. Does an Ulnar Styloid Fracture Require Surgical Treatment?